Why have digital citizenship as a priority at Aorere College? 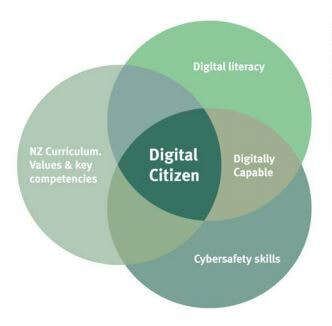 Develop our students as globally-capable "digital citizens"
The following diagram from www.netsafe.org.nz sums up the key attributes of an successful digital citizen. All Year 9 students now do a core subject Digital, Innovation & Design that covers significant cybersafety tuition. Students must at all times use Aorere Digital resources appropriately and for educational purposes. All Aorere College students are required to have a Chromebook or laptop for modern learning. For more information on purchasing a Chromebook, please click here.